Because the eddy currents are generated by a strong permanent magnet, the damping is strong over a wide range of altitudes. After the spacecraft is in its equilibrium position, the magnet continues to track the Earth's magnetic field and thus creates a disturbance torque on the spacecraft. Under certain combinations of damping coefficient, orbital parameters and moments of inertia, the damper tends to move the spacecraft into a nonzero bias attitude. In such cases, a limit cycle exists because the gravity-gradient moment unloaded is equal to but out of phase with the momentum added due to the magnetic field. Eddy Current Rods. Ferromagnetic rods which are coated with a conducting copper sheet and fixed along the principal axes of a spacecraft can be used for libration damping. As the spacecraft librates, eddy currents are generated in the rods because of the change in the geomagnetic field relative to the body coordinate system. The number of rods used does not create a proportional increase in the damping coefficient because the flux density is reduced in each rod. The instantaneous power dissipated is proportional to the square of the rate of change of the magnetic field vector along the longitudinal axis of a rod. Because the eddy currents are generated by the geomagnetic field, the damping produced is inversely proportional to the sixth power of the orbital radius and is not adequate at high altitudes. 1. Alfriend, Kyle T., "Partially Filled Viscous Ring Nutation Damper," J. Spacecraft, Vol. 11, p. 456^62, 1974. 3. Beach, S. W., Linear Analysis of the SEAS A T Orbital Attitude Control System, Lockheed Missiles and Space Co., Inc., GCS/3874/5211, July 30, 1976. 4. 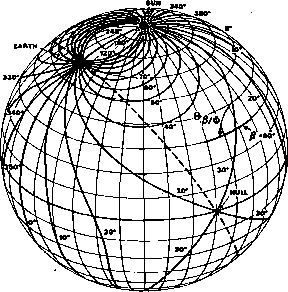 Bracewell, R. N., and O. K. Garriott, "Rotation of Artificial Earth Satellites," Nature, Vol. 182, p. 760-762, Sept. 20, 1958. 5. Carrier, G. F., and J. W. Miles, "On the Annular Damper for a Freely Precessing Gyroscope," J. of Applied Mech., Vol. 27, p. 237-240,1960. 6. Chetayev, N. G., The Stability of Motion. New Yorlc: Pergamon Press, 1961. 7. Cloutier, G. J., Variable Spin Rate, Two-Degrees-of-Freedom Nutation Damper Dynamics, Paper No. AAS 75-045 AAS/AIAA Astrodynamics Specialist Conference, Nassau, Bahamas, July 28-30, 1975. 8. DeBra, D. B„ and R. H. Delp, "Rigid Body Attitude Stability and Natural Frequencies in a Circular Orbit," J. of Astonautical Sci., Vol. 8, p. 14-17, 1961. 9. DiStefano, Joseph J. Ill, Allen R. Stubberud, and Ivan J. Williams, Schaum's Outline of Theory and Problems of Feedback and Control Systems. New York: McGraw-Hill, Inc., 1967. 10. Dougherty, H. J., E. D. Scott, and J. J. Rodden, Analysis and Design of WHECON-An Attitude Control Concept, AIAA 2nd Communication Satellite Conference, San Francisco, CA., Apr. 1968. 11. Elson, Benjamin M., "Design Phase of Space Telescope Nears," Aviation Week and Space Technology, Vol. 107, No. 6, p. 54-59, Aug. 8, 1977. 12. Flatley, T., Magnetic Active Nutation Damping on Explorer 45 (SSS-A), NASA X-732-72-140, GSFC, May 1972. 13. Glaese, J. R., H. F. Kennel, G. S. Nurre, S. M. Seltzer, and H. L. Shelton, "Low-Cost Space Telescope Pointing Control System," J Spacecraft, Vol. 13, p. 400-405, 1976. 14. Greensite, Arthur L., Elements of Modern Control Theory. New York: Spartan Books, 1970. 15. Grell, M. G-, A EM-A Attitude Control Contingency Study, Comp. Sc. Corp., CSC/TM-76/6203. Oct. 1976. 16. Haines, Gordon A. and Corelius T. Leondes, "Eddy Cunent Nutation Dampers for Dual-Spin Satellites," J. of Astronautical Sei, Vol. 21 p. 1, 1973. 17. Hoffman, D. P., "HEAO Attitude Control Subsystem—A Multimode Multimission Design," Proceedings AJAA Guidance and Control Conference, San Diego, CA., p. 89, Aug. 1976. 18. Hsu, J. C, and A. U. Meyer, Modern Control Principles and Applications, New York: McGraw-Hill, Inc., 1968. 19. Iwens, R. P., A. W. Fleming, and V. A. Spector, Precision Attitude Control With a Single Body-Fixed Momentum Wheel, AIAA Paper No. 74-894, Aug. 1974. 20. Johnson, D. A., "Effect of Nutation Dampers on the Attitude Stability of n-Body Symmetrical Spacecraft," Gyrotfynamics (P. Y. Willems, ed.). New York: Springer-Verlag, 1974. 21. Kaplan, Marshal H., Modern Spacecraft Dynamics and Control. New York: John Wiley & Sons, Inc., 1976. 22. Korn, Granino A., and Theresa M. Korn, Mathematical Handbook for Scientists and Engineers. McGraw-Hill, Inc., New York, 1968. 23. Landon, Vernon D., and Brian Stewart, "Nutational Stability of an Axisym-metric Body Containing a Rotor," J. Spacecraft, Vol. 1, p. 682-684, 1964. 24. Lerner, G. M. and K. P. CorieU, Attitude Capture Procedures for GEOS-3, AIAA Paper No. 75-029, AIAA Astrodynamics Specialist Conference, Nassau, Bahamas, July 28-30, 1975. 25. Lerner, G. M., W. Huang, and M. D. Shuster, Analytic Investigation of the A EM-A / HCMM Attitude Control System Performance, AAS/AIAA Astro-dynamics Conference, Jackson Hole, WY., Sept. 1977. 26. Levinson, David A., "Effects of Meteoroid Impacts on Spacecraft Attitude Motion," J. of Aeronautical Sei., Vol. 25, p. 129-142, 1977. 27. Likins, Peter W., "Attitude Stability Criteria for Dual Spin Spacecraft," J-Spacecraft, Vol. 4, p. 1638-1643, 1967. 28. Lyons, M. G., K. L. Lebsock, and E. D. Scott, Double Gimballed Reaction Wheel Altitude Control System for High Altitude Communication Satellites, AIAA Paper No. 71-949, Aug. 1971. 29. Markley, F. L>, Attitude Control Algorithms for the Solar Maximum Mission, AIAA Paper No. 78-1247, 1978 AIAA Guidance and Control Conference, Palo Alto, CA., 1978. 30. Meirovitch, L„ Methods of Analytical Dynamics. New York: McGraw-Hill Inc., 1970. 31. Melsa, James L. and Donald Shultz, Linear Control Systems. New York: McGraw-Hill, Inc., 1969. 32. Mobley, F. F., and R. E. Fischell, "Orbital Results From Gravity-Gradient Stabilized Satellites," NASA SP-107, Symposium m Passive GravityGradient Stabilization, Ames Research Center, Moffett Field, CA., May 1965. 33. Pettus, W. W., "Performance Analyses of Two Eddy Current Damping Systems for Gravity-Gradient Stabilized Satellites," Proceedings of the Symposium on Gravity-Gradient Attitude Stabilization, El Segundo, CA., Dec. 1968. 34. Pisacane, Vincent L, Peter P. Pardoe, and B. Joy Hook, "Stabilization System Analysis and Performance of the GEOS-A Gravity Gradient Satellite (EXPLORER XXIX)," J. Spacecraft, Vol. 4, p. 1623-1630, 1967. 35. Pringle, R., Jr., "Stability of the Force Free Motions of a Dual-Spin Spacecraft," AIAA Journal, Vpl. 7, p. 1054-1063, 1969. 36. Repass, G. D„ G. M. Lerner, K. P. Coriell, and J. S. Legg, Jr., Geodynamics Experimental Ocean Satellites (GEOS-C) Prelaunch Report, NASA X-580-75-23, GSFC, Feb. 1975. 37. Roberson, R. E., and J. V. Breakwell, "Satellite Vehicle Structure," United States Patent 3,031,154, April 24, 1962 (filed September 20, 1956). 38. Stickler, A. Craig, and K. T. Alfriend, "Elementary Magnetic Attitude Control System," J. Spacecraft, Vol. 13, p. 282-287, May 1976. 39. Weiss, R„ R. L. Bernstein, Sr., and A. J. Besonis, Scan-By-Nutation, A New Spacecraft Concept, AIAA Paper No. 74-896, Aug. 1974.